Michael McFadyen's Scuba Diving - Bubble Cave, North Solitary Island The North Coast of NSW has some fantastic diving, none of which is better than the hundreds of dive sites on the Solitary Islands. On 15 May 1770, Lieutenant James Cook in HM Bark Endeavour passed a small group of islands off what is now Coffs Harbour and named them the Solitary Islands. Unfortunately the sun was setting as he approached the southern-most islands and he passed by them during the night. 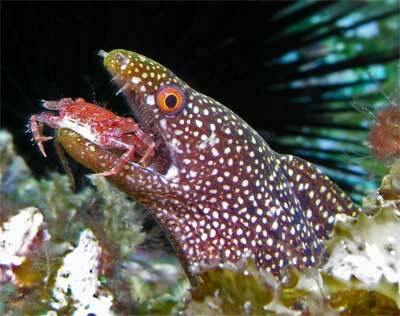 A pity as he may have examined them closer and found the delights that today attract divers from all over Australia. The northern-most of the islands is North Solitary Island. There are a dozen or so dive locations around the island. One of these is The Bubble Cave which is on the western side of the island. The site here consists of a series of fingers that extend from the island down to the sand at 15 metres. The gullies in between the fingers are very interesting and the one furthest to the north contains a very large cave with an air bubble. The dive boat will tie up to the Bubble Cave mooring. As you descend you will see that you are in the middle of one of the gullies. The Bubble Cave can be found by going to the north-west from the mooring over two ridges into the second gutter along from the mooring. Head right up this gutter. The bottom as you get closer to the cave is composed of medium sized round rocks like on the bottom of a river. The depth goes from 13 metres on a slope up to about five metres at the entrance. This is located on the western side of the gutter and is not always that obvious. The whole entrance to the cave can be blocked by fish and even after parting them, there can still be more in the way. The depth inside the cave is about four metres and it slopes up to perhaps three metres and turns a little to the right. It is a fairly large cave. 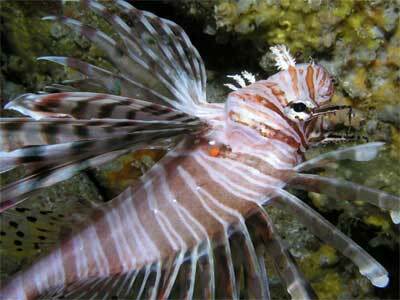 There are normally lots of firefish in the cave, mostly on the walls and top of the cave. Head back out of the cave and go over the wall to the left and follow this gutter back to the 12 metre depth. The mooring should be over the ridge to your left. Go out south and you will see that there are thousands if not tens of thousands of anemones here (in fact I think more than in the Bay of Anemones) and you can have a very enjoyable dive without travelling too far from the boat. 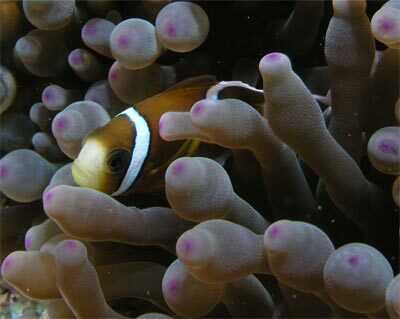 The anemones are home to more clownfish than you will ever see. There are numerous species, including Clark's anemonefish, red anemonefish, false clown anonemefish, three spot dascyllus, orange anemonefish and more. Head further south for a while and you will see some concrete blocks with plaques on them. These were put here by the NSW Marine Parks Authority but this was a poor job. The blocks have moved as they do not appear to have been anchored to the bottom and it appears that no maintenance whatsoever has been done on them as when I last dived here you could not read a single plaque. I scraped four clean before giving up. The plaques are part of an underwater trail, with one bit giving directions to the next and the other giving some information. A good idea poorly executed and not maintained. Also in this area you will see bits of a fishing trawler that sunk here in about 1988 or 1989. The bits are covered by growth and it is now difficult to tell what is what. From here go south-east till you hit the small wall where the depth rises from 12 or 13 metres to 10 or so metres. Follow this back to the left towards the Bubble Cave. As you go, zig-zag back and forward. You will find some fantastic things like guineafowl moray eels (see the photograph below of the one I found with a cleaner crab in its mouth), many different species of nudibranches and more. Head back towards the mooring. If when you arrive at the mooring you still have air and bottom time, go west for a bit or up one of the gutters that you have not yet examined. On my dives here I have averaged over 75 minutes and up to 90 minutes. 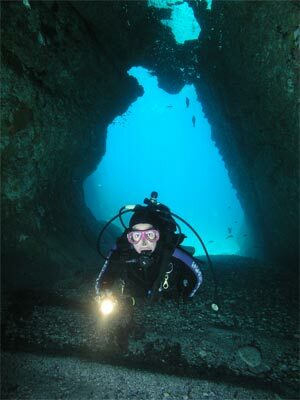 Another great dive site.